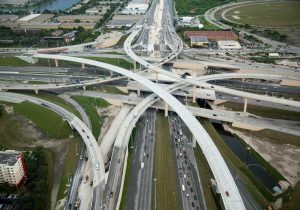 With five projects being executed and seven others in the pipeline, the Miami-Dade Expressway Authority (MDX) is rapidly enhancing Miami’s road infrastructure. MDX, the entity that manages, maintains and funds improvements to five local expressways, and is funded only by tolls collected on the Dolphin SR 836, Gratigny SR 924, Airport Expressway SR 112, Don Shula/SR 874 and Snapper Creek SR 878, is executing important projects in order to improve Miami’s traffic conditions. Even though partnerships with other public entities such as the Miami-Dade Department of Transportation and Public Works (MDT) and the Florida Department of Transportation (FDOT) have been essential to executing some of the current projects, MDX has been able to embark on these new projects because of the improvement in its funding system. Instead of just 50% of drivers paying, now all users pay for the portion they drive. This, combined with funding through bonds, has allowed MDX to adopt sensible policies to tackle traffic in Miami-Dade. “The increase in revenue is because of three reasons: Everyone pays their fair share for the use of the road, the economy has grown, and the population has increased, resulting in higher traffic volumes and improvements that MDX has already made allows for increased capacity on its expressways.” Louis Martínez, Chair of the MDX Board of Directors, stated in December 2016. “When we made changes to our system in 2014, we promised to construct improvements that would save travel time for our customers. We are ahead of schedule in fulfilling this promise,” he added. One of MDX’s major projects, the SR 836 Modernization from NW 57th Avenue to NW 17th Avenue, will include a diverging diamond interchange, also called a double crossover diamond interchange. This is a type of diamond interchange in which the two directions of traffic on the non-expressway road cross to the opposite sides. The project is scheduled to be completed in summer 2018, almost at the same time as the MDX SR 836 Interchange Improvements at 87th Avenue, another project currently under construction, will finish. MDX explains that the main purpose of the project is to improve traffic operations and safety of the SR 836 and NW 87th Avenue Interchange. A significant improvement will be the addition of a new flyover ramp that will provide direct connection from westbound NW 12th Street to westbound SR 836. This improvement will substantially reduce the congestion at the intersection of NW 87th Avenue and NW 12th Street. In an earlier stage is the SR 836 Improvements from 17th Avenue the Midtown Interchange, which is being constructed in partnership with the FDOT and is expected to start construction by the end of this year. The MDX SR 874 Ramp Connector to SW 128 Street is currently underway. It will provide alternative expressway access to the area, reducing congestion and providing additional connectivity and mobility to the rapidly growing area of southwest Miami-Dade County. Finally, MDX will produce the Dolphin Station Park and Ride Transit Facility in partnership with MDT and the FDOT. The transit facility will support the Department of Transportation and Public Works’ SR 836/Dolphin Expressway Express Bus Service, provide a terminus or stop for several local bus routes serving the Dolphin Mall and the cities of Sweetwater and Doral, as well as serving a potential future east-west commuter rail service on the CSX line.